This commercial-quality 160mm (6.30") blade is ideal for rip and cross-cutting two sided veneer plywood, whether finished or unfinished. It is also perfect for cutting solid woods. In fact, there is no comparable blade on the market today. 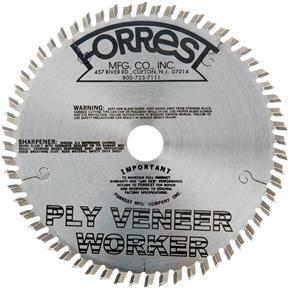 The Ply Veneer Worker (PVW) uses the same high-precision technology that's behind the popular Forrest Woodworker II blade. Designed for cutting wood products only. Works like a charm with the Grizzly T10687 Track Saw! 60T, 160mm, 20mm bore. Tooth style ATB. Kerf 0.100".